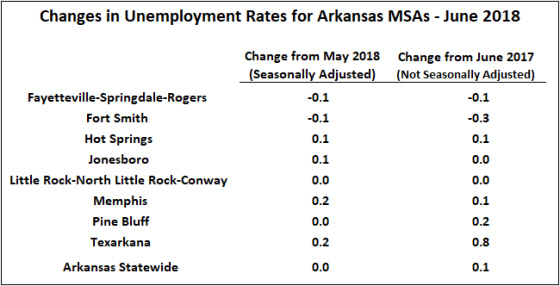 In the latest metropolitan area data from the Bureau of Labor Statistics (BLS), unemployment rates ticked lower from May to June in two of the metro areas that include parts of Arkansas, were slightly higher in four areas, and were unchanged in two. Unemployment rates are little changed from a year ago, with the exception of Texarkana where the unemployment rate now stands at 0.8 percentage points higher than in June 2017. In fact, the news release from the BLS notes that the increase in Texarkana was the largest in the nation. As shown in the figure below, unemployment rates in both Texarkana and Memphis have been trending upward since the end of 2017, with Texarkana up by nearly a full percentage point over the first six months of 2018 (seasonally adjusted). 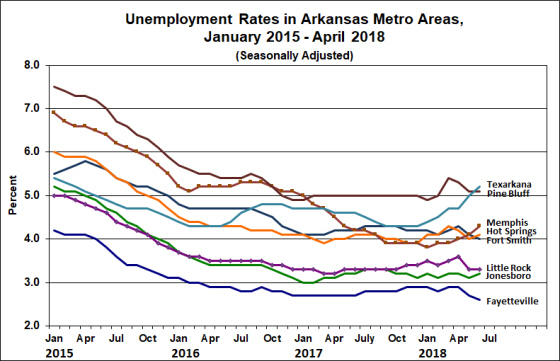 Meanwhile, rates in Northwest Arkansas are trending somewhat lower, with the unemployment rate in Fayetteville-Springdale-Rogers metro area declining from 2.9% in December 2017 to 2.6% in June. The eight metro areas have evidently converged into three groups: Texarkana and Pine Bluff have the highest rates — with unemployment rates in both areas now above 5%. Memphis, Hot Springs and Fort Smith have settled-in at just over 4% while Little Rock, Jonesboro and Fayetteville have fallen into the neighborhood of 3%. Figures on nonfarm payroll employment were mixed. The three metro areas that have seen employment expand the most over the current expansion (Fayetteville, Jonesboro, and Little Rock) all experienced monthly declines in June. Pine Bluff was also down for the month. Compared to a year ago, all of Arkansas’ metro areas except Pine Bluff are showing unchanged or higher employment. Over the longer run, employment growth trends among the state’s metro areas continue to diverge. 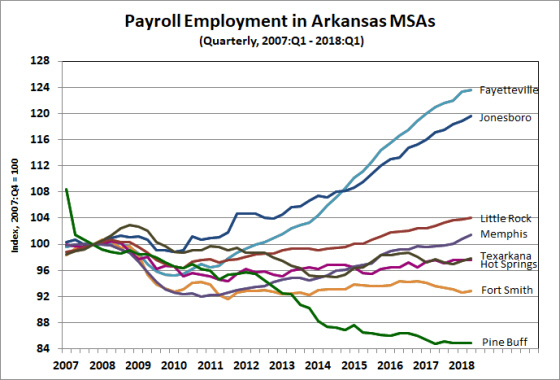 Jonesboro and Fayetteville still lead the pack with employment up nearly 20% and 24%, respectively, since the previous cyclical peak at the end of 2007. Little Rock and Memphis are also in positive territory, albeit with significantly smaller cumulative gains. The other four metro areas continue to show net employment declines from the pre-recession levels of a decade ago. Pine Bluff, in particular, has suffered dramatic cumulative job losses, with employment falling by 12.4% since the beginning of the current expansion’s employment recovery (February 2010).